ELISA: Antibody detection limit dilution 1:4,000. 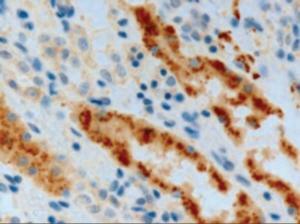 Immunohistochemistry: In paraffin embedded human kidney shows cytoplasm staining in cells of renal tubules. Recommended concentration, 3 μg/mL. Adenosine A2 beta Receptor antibody was purified from goat serum by ammonium sulphate precipitation followed by antigen affinity chromatography using the immunizing peptide. Adenosine A2 beta Receptor antibody is supplied in Tris saline, 0.02% sodium azide, pH 7.3 with 0.5% BSA.